Hiya guys! Today I'm sharing swatches for the gorgeous Apple Orchard Trio from Tux Polish. An absolutely stunning all holographic trio of polishes named after the delicious apples they're inspired by. Spoiler alert these are some of my favorite polishes this season! But also Tux Polish will be releasing another set of polishes called the Fall Classic Cremes that can stamp and watermarble. You can check out swatches for those over the weekend available in this post. 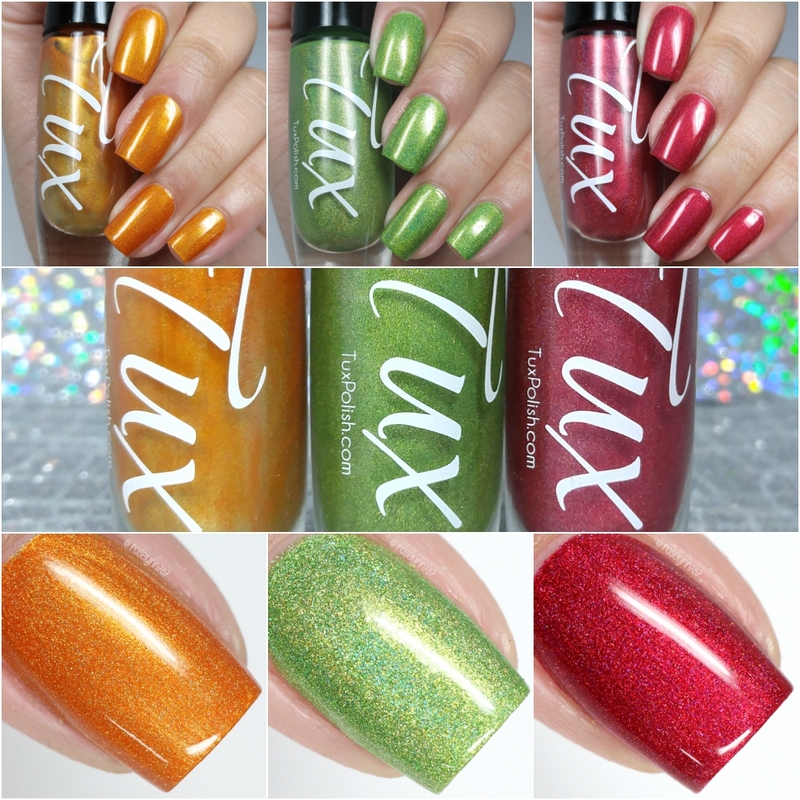 The Apple Orchard Trio from Tux Polish will be releasing today, Friday September 23rd. Each full-size 10mL bottle retails for $10.00 each or you can get the trio set for $30.00. Red Delicious can be described as a red holo with deep red shimmer. Starting off with my favorite among the three, this is such a gorgeous red tone! I love how vibrant it is while still being totally vamp. The formula has a smooth opaque application, it could almost be considered a one-coater. I did end up deciding to add a second coat, but it was mostly due to wanting a little more sparkle than needing coverage. And despite how pigmented the shade is I experienced no staining on removal after a day of wear time. Shown here in two coats and sealed with a glossy topcoat. Granny Smith can be described as an gold-toned green holo. From the three I definitely feel like this one has such a stronger holo finish. Even being taken in a light-box you can see how much more it sparkles! Normally green is not a shade I love wearing, but this one breaks that rule and throws it out the window. It's so much more gorgeous in person! The formula has a nice smooth application once again, but it's not as opaque as Red Delicious. Needs minimal layering for complete coverage and has a nice quick dry-time. Shown here in two coats and sealed with a glossy topcoat. Orange Pippin can be described as an orange holo with golden shimmer. I wasn't expecting to love this orange as much as I do, but its ended up being one of my favorites this season. The tone compliments my skin-tone so nicely and it really ends up feeling like a shade I'd enjoy year round. The formula has the same consistency as the others, not too thick or too thin. Good amount of opacity as well, but does need more than a single layer for complete coverage. Shown here in two coats and sealed with a glossy topcoat. Overall if you're a holo-lover then chances are you are going to love these as much as I do. My photos really don't do the holo sparkle any justice (I am stuck swatching at night, boo). Not only do these look gorgeous on their own, but they make gorgeous nail art together as well! Formulas are all very consistent with one another and on par with what Tux Polish is known for. All three have a great dry-time and also end up dying to a high shine on their own. Definitely highly recommend picking these while you can because they are limited edition and will not be restocked once sold out. To recap, the Apple Orchard Trio from Tux Polish will be releasing today, Friday September 23rd. Each full-size 10mL bottle retails for $10.00 each or you can get the trio set for $30.00.